Carrozzeria Ghia is primarily known as a coachbuilder that was founded in Turin in 1916 by Giacinto Ghia. Ghia bodies have appeared on cars from many marques, from Alfa Romeo to Volkswagen to a series of Chrysler cars. There was a short period of time where the company built a few of their own cars. Three models to be exact, with this being the sportiest. The 450 SS was a convertible (with removable hard top) that was offered between 1966 and 1967. It started as a concept car where Ghia put a convertible body on a Fiat 2100 sedan. A Hollywood producer convinced Ghia to put it into production, using a 235 horsepower, 4.5-liter Chrysler V-8 instead of whatever Fiat powerplant they were considering. The stuff underneath was now based on a Plymouth Barracuda. 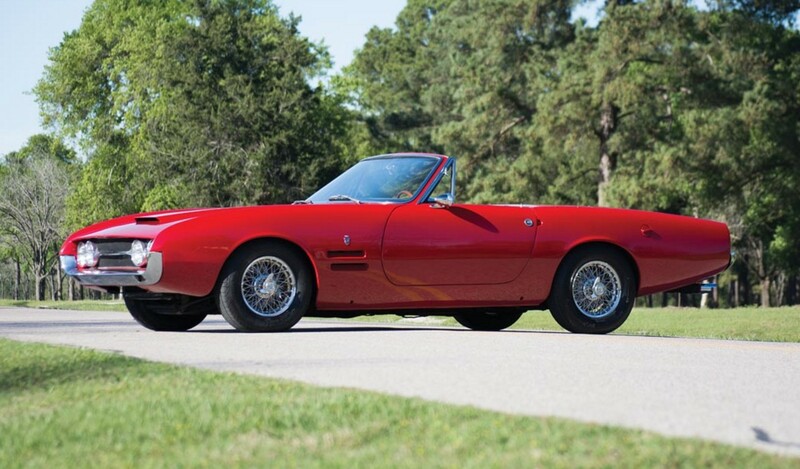 Think of it as an Italian muscle car (like the Iso Grifo). They only built 56 of these and it is believed that about 26 remain. This one has never been restored, but carries 59,000 miles and fresh servicing. You’ll never pass another one on the road. It should bring between $120,000-$140,000. Click here for more info and here for more from this sale. This entry was posted in Uncategorized and tagged 1967, 450 ss, auctions, cars, classic cars, ghia, worldwide auctioneers by classiccarweekly. Bookmark the permalink.